It is with a feeling of deep sorrow, I pen these lines on the demise of my teacher Ven. Ambanwelle Pannasekera Anunayaka Thera. Way back in the 1950s - 1960s, this learned great Buddhaputra was residing at Walukaramaya, Kollupitiya, where Mawittare Sri Revatha Nayaka Thera was the Chief Incumbent. During this period I was under Pannasekera Thera who was a leading lecturer and a great teacher at the Vidyodaya Pirivena, the crest jewel of Buddhist education. I learned Sinhala, Pali and Sanskrit during this era. In my life I have never seen such clear, artistic hand-writing as displayed by Venerable Thera. In fact Pannasekera Thera wrote the Credential Papers of Dr. Gunapala Malalasekera, to be presented to the Head of the Soviet Union when he was appointed as our High Commissioner to Soviet Russia as the first Ambassador to Russia. Ven. Pannasekera was a gold-mine of knowledge. His pleasant charismatic personality added more colour to this great scholar. He passed away on Tuesday, April 7, 2009, aged 85. He was a student at Vidyodaya Pirivena, and he shone like a bright star. Through sheer determination, and commitment he pursued his studies and obtained the Rajakeeya Pandita epithet, won the Siamese prize for the best student at Vidyodaya Pirivena, and later became a lecturer. His service to Buddhist and general education is enormous. Later, he joined the leading Buddhist school in Sri Lanka - Ananda Vidyalaya and served there for nearly two decades. Ambanwelle Pannasekera Anunayake Thera was an erudite scholar, an eloquent preacher, and an internationally reputed monk. He was a vociferous reader. I have never seen a Buddhist monk, so meticulous, methodical, organised and flawless in whatever he did. May be in the future, the great performances of the great Pannasekera Maha Thera be matched, but they will never be surpassed and eclipsed. It is undoubtedly an irreparable loss to Buddhism, Sanga Sasana and general public. Born in Ambanwella, Walapone on December 27, 1924, he was ordained on January 25, 1940 under the tutelage of Ven. Ambanwelle Sri Ratanasara Thera. 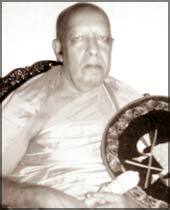 He received higher ordination at the Uposathasaraya of Malwatte Chapter on June 6, 1945. After serving as a teacher at Ananda College, Colombo and several schools, he also served as Parivenadhipathi of Sangaraja Pirivena affiliated to the Malwatte Maha Viharaya. Ven. Ambanwelle Sri Pannasekera Anunayake Thera’s cremation was held April 11 in Kandy. May my teacher Ambanwelle Sri Pannasekera Anunayake Maha Thera attain the Bliss of Nibbana!